The 2017 annual reports on fisheries in Hawaii and the U.S. Pacific Islands provide data and trends about last year’s fishery participation, catch rates, landings and other fishery performance factors. Each report also covers ecological components that may impact fishery outcomes, such as protected species interactions, climate and oceanographic conditions and socioeconomic factors. The Western Pacific Region Status of the Fisheries 2017 summarizes highlights from the reports and is available by clicking here. The complete annual reports are available at www.wpcouncil.org/fishery-plans-policies-reports/fishery-reports-2/. 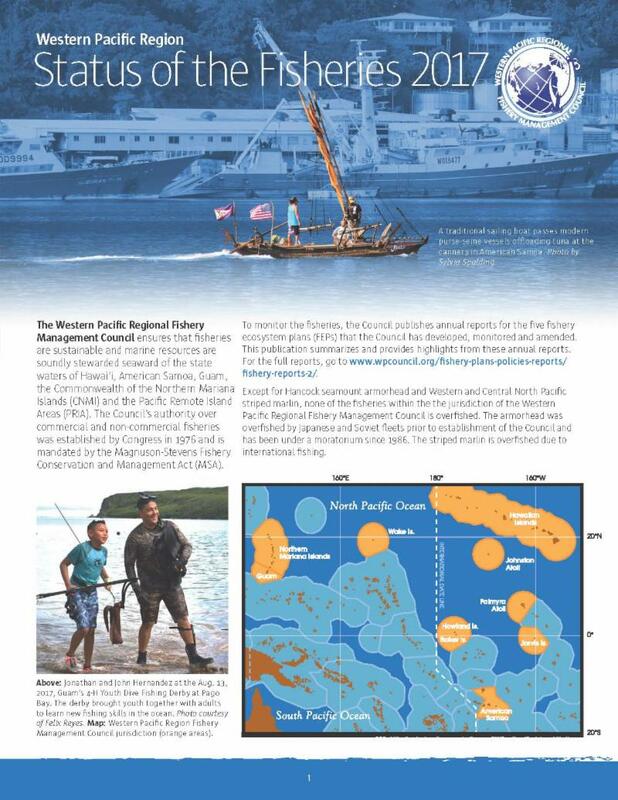 Annual reports are produced for each of five fishery ecosystem plans (FEPs) that have been developed, monitored and amended by the Western Pacific Regional Fishery Management Council. They include the Pelagic FEP, the Pacific Remote Island Areas FEP and FEPs for the Hawai’i Archipelago, American Samoa Archipelago and Mariana (Guam and the Commonwealth of the Northern Mariana Islands) Archipelago.